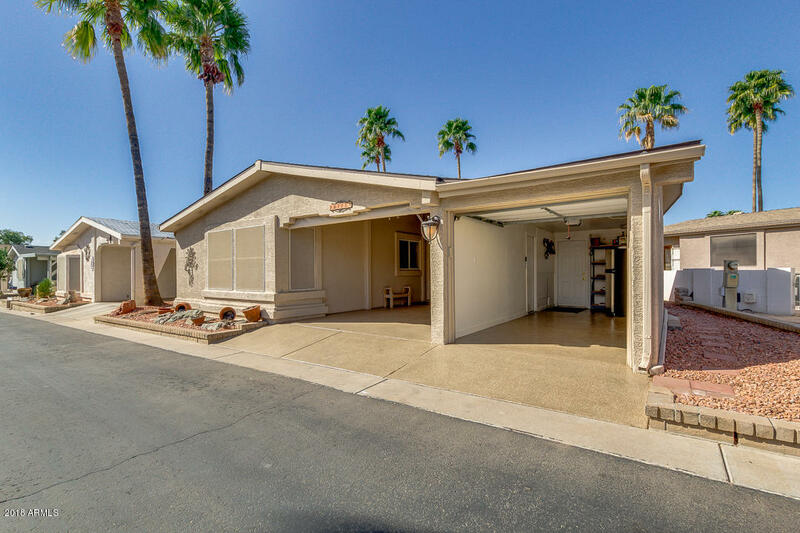 2 Bed, 2 Bath, Golf Course Lot in SunBird Golf Resort, Chandler. This stunning home on the 15th Fairway has great golf course views and beautiful Sunsets. Home Features Double Golf Cart Garage with room for a Workshop, Full Length Covered Back Patio with Nets and Drop-Down Screens, Split Floorplan, Vaulted Ceilings and Built-in Dining Room Cabinets. Upgrades Galore: Dual Pane Windows, Roof, Copper Plumbing, SS Appliances, Granite C-Tops, Backsplash, Sink, Washer and Dryer, Flooring, Ceiling Fans with Lights and Remotes Throughout Home and in Carport, Popcorn Ceiling removed, Walls Texted and Painted, Solar Tube, Back Patio Barn Door and Lights, Security Door, Professionally installed Coating on Driveway, Garage and Back Patio. Furniture must be purchased with home on Separate Bill of Sale.